With all the snow we’ve been getting the girls and I needed a day to get out of the house so I packed them up and we headed to the Palisades Mall in Westchester. The mall is huge and we even found an adorable play arena called Billy Beez that the girls worked up the need for a healthy snack. Considering I was running in two different directions through tunnels and down slides, this mama had earned one so we headed over to Jamba Juice for some Healthy Snacks On-the-Go. The girls can’t resist a smoothie. Especially when they get to use a straw. Avery learned to use a straw before she was a year old just so she could steal sips of my smoothies. We have a bit of love for fresh fruit smoothies. Although her ability to use a straw, does not stop her from sucking the juice out of the side. 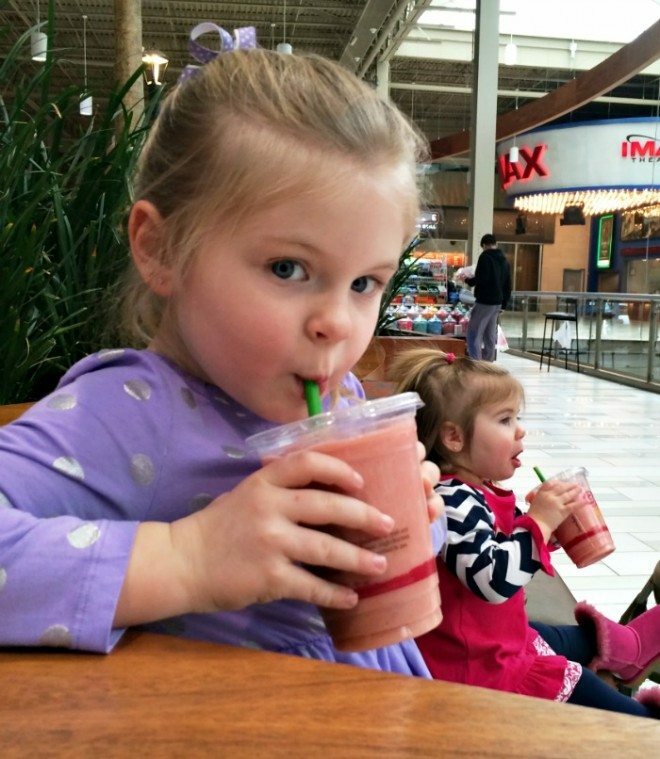 Riley loves her smoothies as long as they contain strawberry and banana. The girls are only so patient though when it comes to waiting for their smoothies to be done. Plus, I clearly don’t have much time to sit back and enjoy a smoothie of my own since I spend most of the time trying to make sure that Avery doesn’t spill her’s all down the front of her. 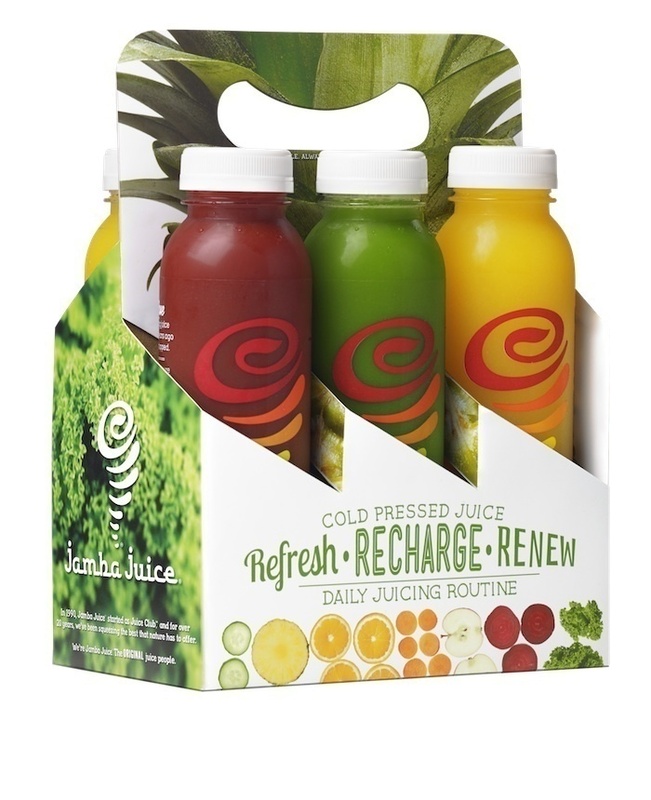 Luckily, Jamba Juice has created Fresh Squeezed Juices that are easy to grab-and-go. 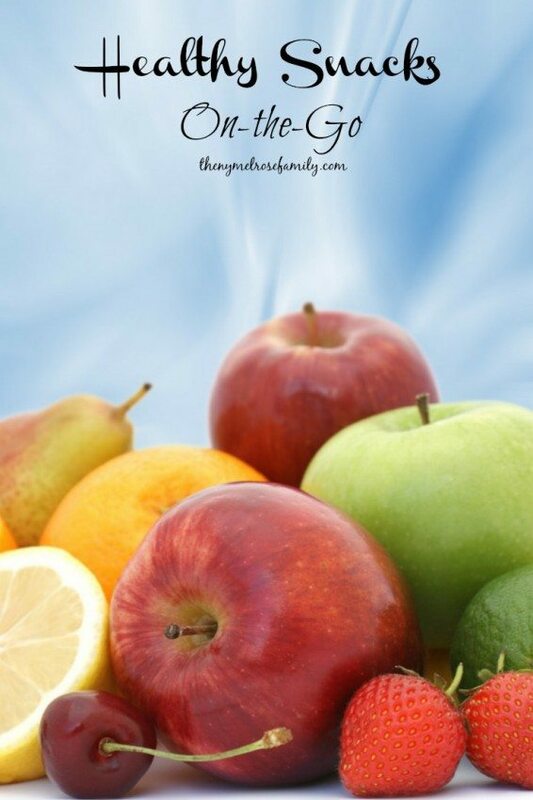 They contain no preservatives and are 100% juice so they are the perfect healthy snack for busy parents that have little to no time to themselves. Plus, I can feel good knowing that they are a healthy, paleo, fresh pressed snack. Since I knew that the girls had every intention of dragging me back to the play arena, I knew I needed Cold Pressed Juices in an easy grab-and-go container. No waiting. Just grab-and-go or grab-and-run in my case. I chose the Tropical Greens because I can’t resist tropical flavors combined with apples, pineapple and super greens and I clearly needed some super greens energy. I could have easily grabbed one of the other three flavors of Orange Reviver, Citrus Kick or Veggie Harvest. The Orange Reviver with it’s oranges, apples, bananas and beets are the perfect spirit uplifter, while the Citrus Kick with it’s blend of oranges, apples, pineapples, and ginger sounded like the perfect soothing blend. The Veggie Harvest, on the other hand, with it’s apples, carrots, beets, super greens and ginger sounded like the one two punch that any busy day could use in order to get it all done. I just couldn’t resist my tropical fruit. A little healthy goodness with a tropical twist that made me think I just might have a chance to relax. The best part is that since I enjoyed my Cold Pressed Juice so much I want to offer you the opportunity to win a Jamba Juice gift card. Simply comment with what Cold Pressed Juice juice flavor you would want to try and you’ll be entered to win. It’s that simple! So, what would you choose? Tropical Greens, Orange Reviver, Citrus Kick or Veggie Harvest? I’d like to try the Citrus Kick. I think that the Tropical Greens sounds delicious!